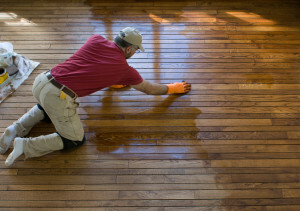 Refinishing your hardwood floor can be one of the most rewarding things you can do. It can revitalize your home and can add thousands of dollars in value to your home as well. The best part is that you do it yourself and save hundreds if not thousands of dollars in labor. You do not have to hire a contractor to come and do the work for you. The downside is that you do the work and it may take longer than planned. Especially if you are limited to week nights and weekends. But the end result is definitely worth it. Before you begin there are two things to make sure are ready. First the family must be supportive. This may seem a meaningless item. However if this work may take a few days or weeks. The room you are working on is not going to be available for use during that time, the family needs to be supportive. There will also be more dust in the house than normal. Your spouse must also be on board with a protracted work schedule. If they are not on board, then you may just want to hire a contractor to get the work done quickly with minimal disruption. There is still going to be disruption and dust everywhere. But at least the job will be done quickly although it will be much more expensive. The next item is to clear the room of all furniture and window treatments along with anything that is on the walls or in the closet. No use having to work around them and also getting dust on everything. You will also want to remove the corner round so that you can sand right up to the wall. If you are careful removing the corner round, you may be able to reinstall it when you are finished. If you are not that fussy about sanding right up to the wall then just leave the corner round in place and sand as close as you can to the corner round. Decide how your floor will be sanded. If you are using a power sander with an attached vacuum you will be able to at least capture the majority of the dust, but not all. Do not use an orbital sander since this will cause scratches across the grain. Always sand in the direction of the grain to avoid this sort of scratched look. It will really show up when you varnish the floor or stain the floor. If you make a mistake you will just have to do some more sanding until those scratches can no longer be seen. Cleaning is paramount when you are finished sanding. You must remove all dust from the floor and the walls to avoid it showing once you varnish the floor. After each coat of varnish, you will need to do a very light sanding with extremely fine sand paper to remove all of the marks and rough the varnish up just a bit so the next coat will provide a nice smooth finish. Old hardwood floors when they are refinished add character and value. If your floors are gleaming and looking brand new, your home will be worth thousands of dollars more than it would have without the floors being finished. Many consumers will hire contractors to do the work for them while others will do the work themselves. It really comes down to support from the family, how much time you have vs. how much a contract will cost to do the work for you. Take the time to learn how to do the job properly so that your time and work is not wasted! And you will have fantastic hardwood floors in your home.